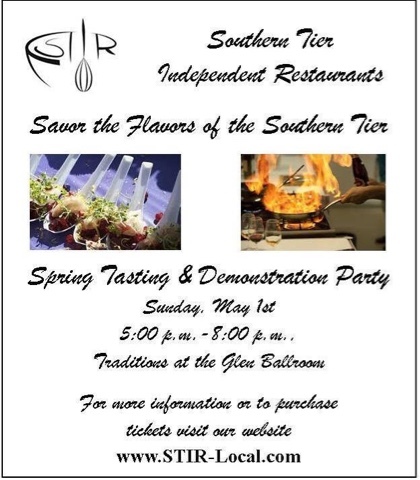 I was chatting up my friend Kristen Roby, the fabulous food writer for the Press & Sun Bulletin, at the Southern Tier Independent Restaurants' Spring Tasting Party last Sunday, and she casually dropped into the conversation that it's food event season. Since I've judged two and attended another in the span of the last two weeks, I guess she's right! 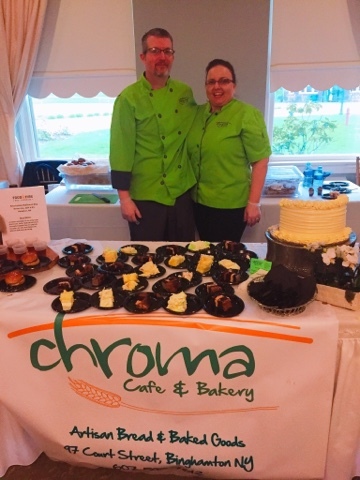 In last week's Watetown Daily Times column, I covered Watertown's Taste of the Town, which benefitted the Victims Assistance Center in Jefferson County. 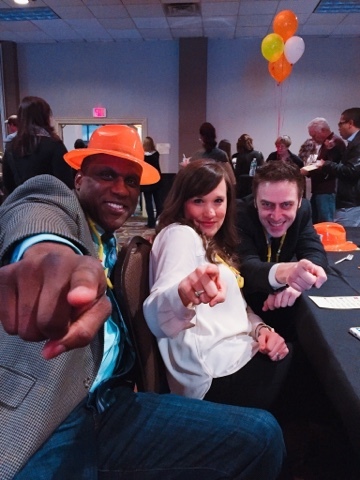 I served as a judge at that event, and we picked Mr. Bigg's as our Best Local Taste of the Town. 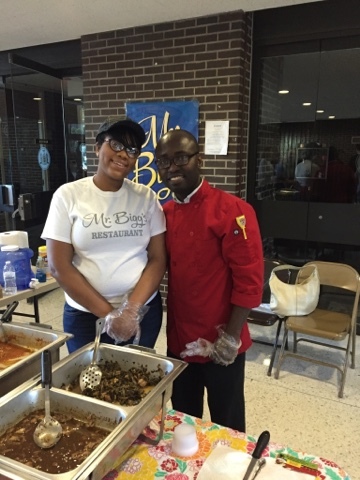 Last week, it was the Binghamton Philharmonic's turn to hold a fundraiser, and it manifested as the Mac & Cheese Fest. I'm not gonna lie, I pressured my buddy Dan, who's on the Philharmonic board, to let me judge this. 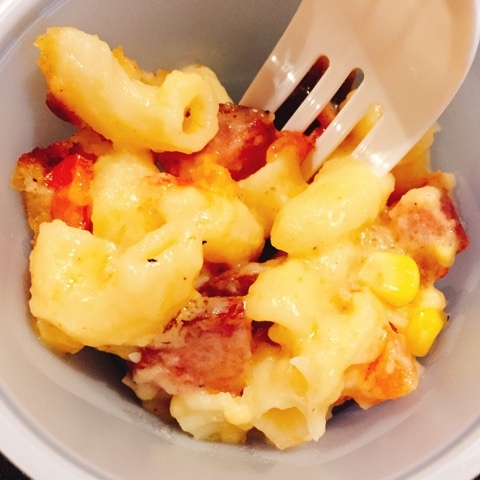 Because mac & cheese, you know? Yeah, that's me. 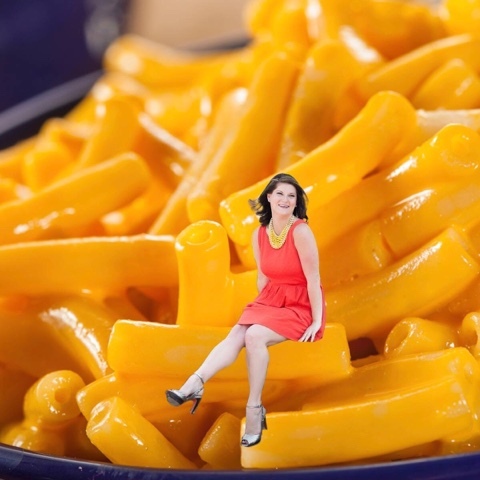 Perched on a noodle, loving macaroni and cheese. Wanna make something of it? 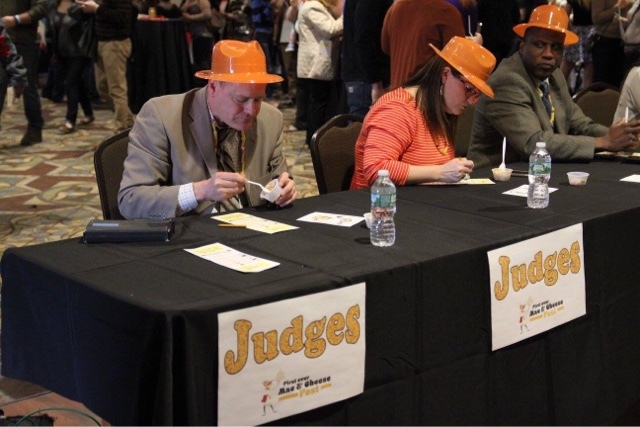 My fellow judges and I (this is Jim Ehmke and Ty Muse as captured by the event organizers) sampled 28 kinds of macaroni and cheese from restaurants in the Binghamton area, and about 1,000 lucky ticketholders accompanied us. This was some serious eating. 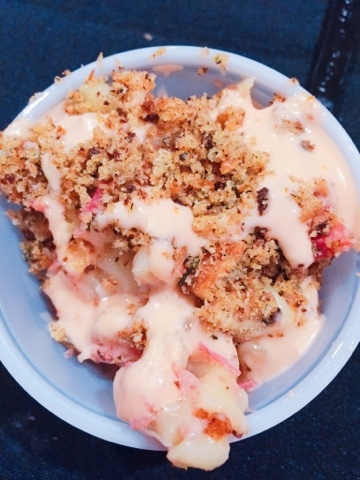 Among my favorites: Ransom Steele Tavern, in Apalachin, made a reuben mac, with assertively crunchy breadcrumbs for texture, a good amount of corned beef, sharp cheese, and just a little sweetness from the Thousand Islands dressing. I never thought I would be praising The McKinley, believe me. Because my day job's on Huron property, I've eaten lots of the food the event space in Endicott serves up, including its daytime cafeteria fare, and never been very impressed. 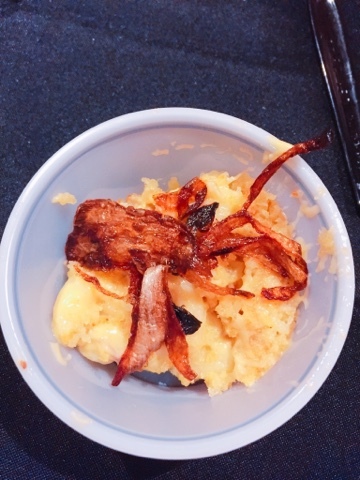 Well, watch me eat my own words along with McKinley's delicious French onion mac and cheese, which was very cheesy, but also flavored with sweet caramelized onions, some crispy, fried onions, and enough seasoning to balance out the sugars of the cooked-down veg. Whenever I go to Food & Fire, in Johnson City, (which is often), I already order Dan's macaroni and cheese. He uses smoked Gouda in it, and I am a total sucker for the gently smokey, extremely creamy, kind of luscious but also a little sharp, flavor of that cheese. 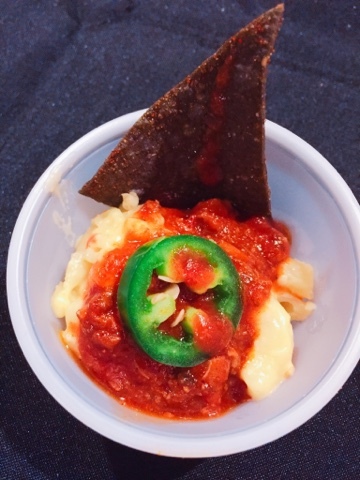 For the fest, he took that gooey mac and topped it with the BBQ restaurant's chili and a slice of fresh jalapeño. I can't tell you how welcome that spice was after sampling an excessive amount of rich cheese sauce. Hi Joshua! Hi Jennifer! Hi Ty, even though we've already met you! I also found The Night Kitchen's dish very tasty. This is a restaurant in Binghamton I've been meaning to try, known for its southern-tinged comfort food and indulgent burgers. This mac had great texture, thanks to some toasted breadcrumbs, plus good spice and cheesiness. 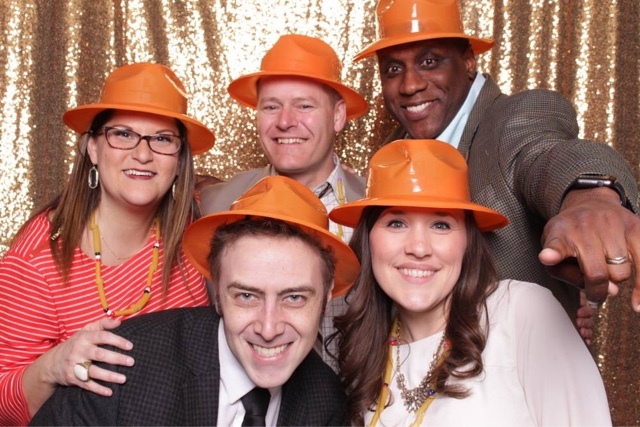 You wouldn't believe how many samples we tried that had no real cheese flavor, but TNK's was full of cheddar richness. Ok, it's time for the money maker, and it was the very first mac out of the gate that we were served. Our judges' choice was from Amici, the brick oven pizza joint in Binghamton. It was gnocchi, bacon, and a well-seasoned, very cheesy, tight sauce. I couldn't stop eating it. I hope these folks add it to their menu! Back to this last Sunday, and STIR's Spring Tasting Party. I'm not gonna lie, I was a little food festivaled out by this thing, but I always get to visit with all my local friends in the food industry at this event, and I wasn't passing that up. Plus, Melinda came with me, and an evening out with her is always a good time. We started with an anracini from A Tavolo, in Windsor. 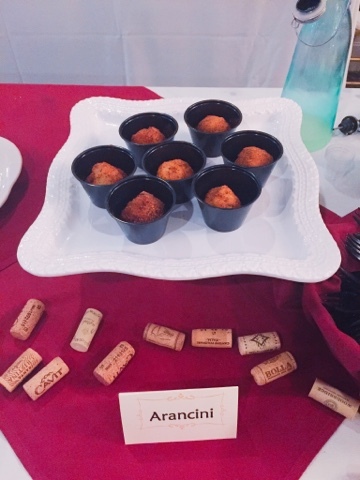 I can't tell you how angry I am that someone local is making fried rice balls this good, with a tiny nugget of gooey mozzarella cheese in the middle, and I haven't been there yet! Who wants to go to A Tavolo with me for dinner? 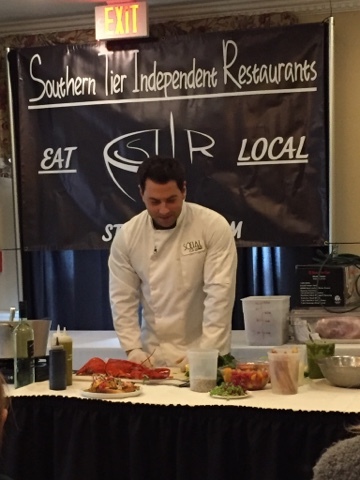 We went to Chef Jay Piculli's cooking demo because he was cooking lobster. 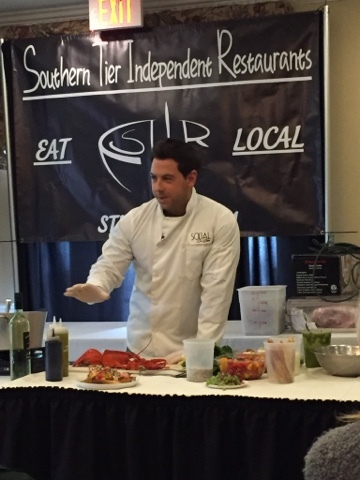 If you haven't been to his Social on State yet, you might not know that it serves the best lobster dishes in the Southern Tier. But now I know how to make two of them! Hey Jay, pipe down and make me your angry lobster! Um, please? Thank you! 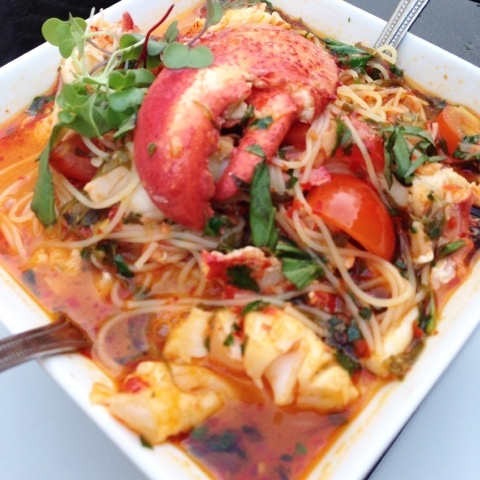 I learned the secrets of angry lobster AND got to eat it. I'm not telling you the secrets, because you need to come to the event next time and learn for yourself AND you need to go eat it yourself, because this brothy, spicy, herbal shellfish and pasta dream has to be tasted to be believed. Chef Rick, from P.S. 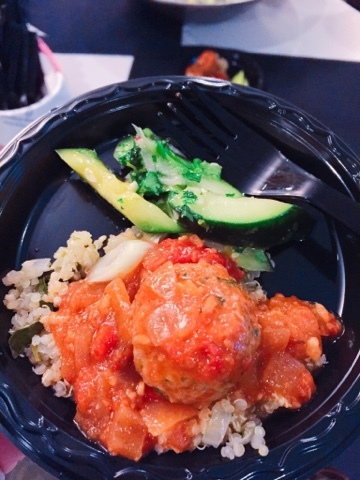 restaurant delivered a lamb meatball that was juicy and savory, nbut better still, a mint and cilantro cucumber salad that knocked my socks off. I love this man's salads! I liked their triple chocolate cake, but it was the moist, creamy white cake with raspberries that knocked my socks off. I'm not typically a big raspberry fan, but they were employed as the tang agent to keep sweetness at bay in this tender, moist cake to great effect. If you've read this recap, or attended either of these events, I challenge you to allege that Binghamton doesn't have a food scene. I frequently hear generalizations that put down these communities for not having a whole lot going on. Having attended both these, plus Watertown's event the weekend before last, I can affirm that Upstate NY has a lot of culinary bright spots, and that's not even counting Syracuse, the Finger Lakes, the Capital region, or Western New York! 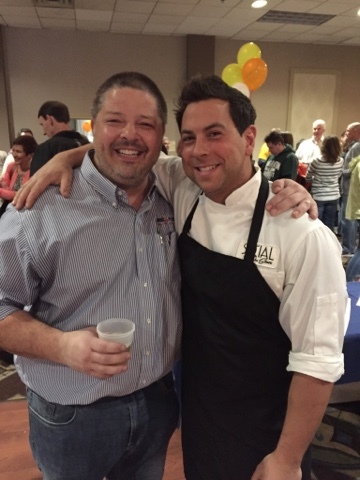 And not only do these talented chefs and fun restaurants reside right here in little old Binghamton (or Endicott, or Vestal...), but they also lend their time and their products to charity events that give even more back to our communities. I think we have a lot to be thankful for this season of foodie events. My personality is big; my hunger is bigger! Claudia and I have been to A Tavolo once last summer and liked it. We could go together if you are going to review since we wanted to go again. Need to pick your brain a little since we spend time at The River.